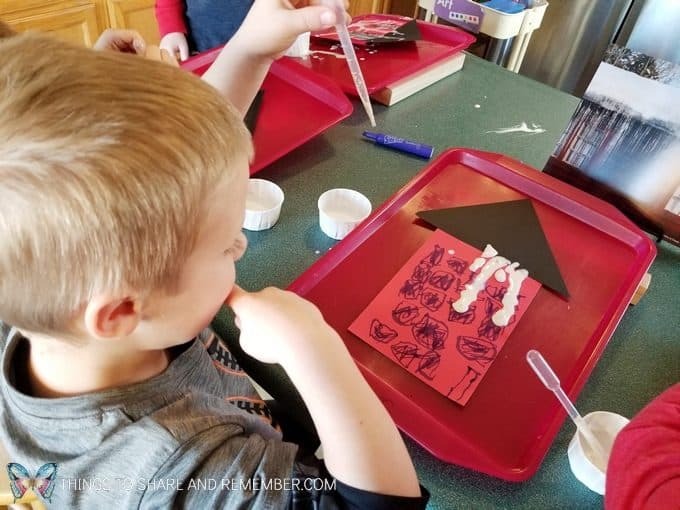 One of our awesome days of Mother Goose Time lessons focusing on Sights and Sounds of winter was all about winter ice. 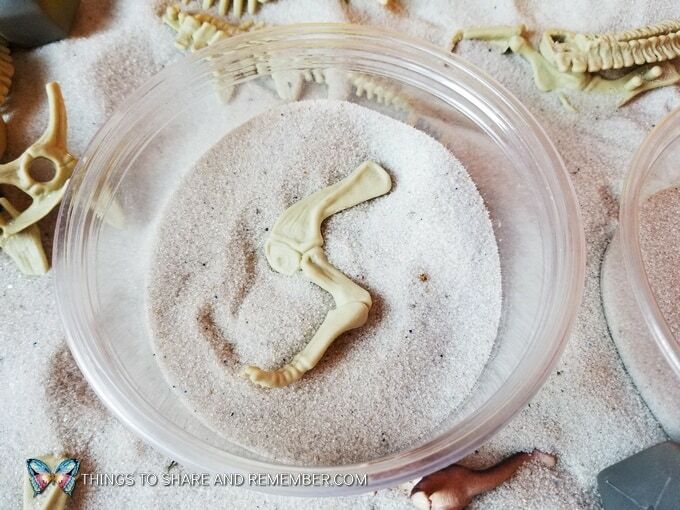 Other topics we’ve covered this month are animal tracks in the snow and the sound of drums. 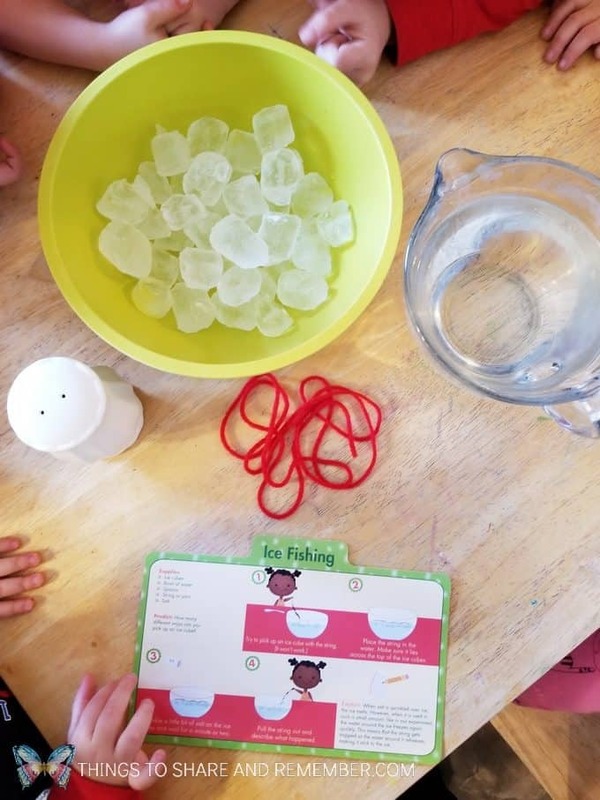 Our conversation started out with “What do you need to make ice?” With a mixed age group, there’s usually someone who knows the answer! Our December days have gone so fast! We really tired to keep up with circle time, covering our calendar, weather and daily topics. The Sights and Sounds of Winter theme is so rich and full for celebrating winter and the holidays. We’ve really enjoyed it! 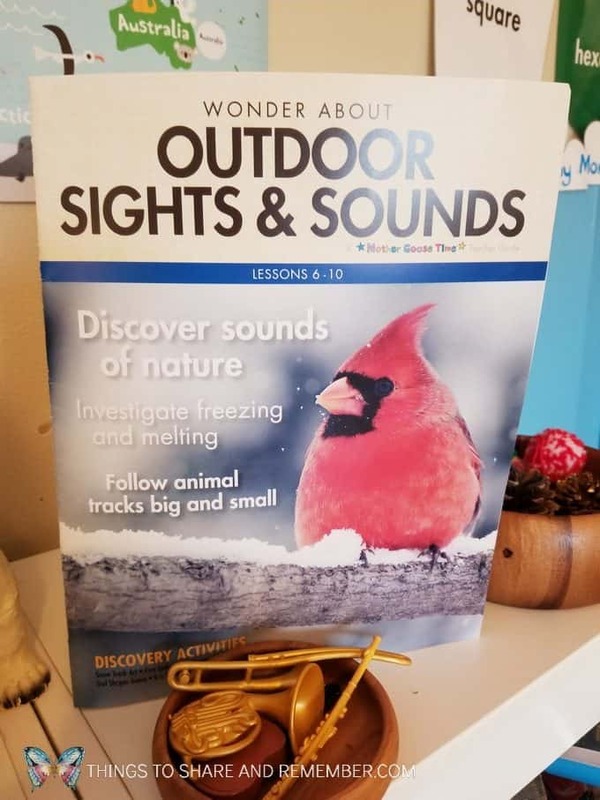 Along with winter ice, we’ve learned about other outdoor sights and sounds of winter like, animal tracks, owls, bells, and winter birds. 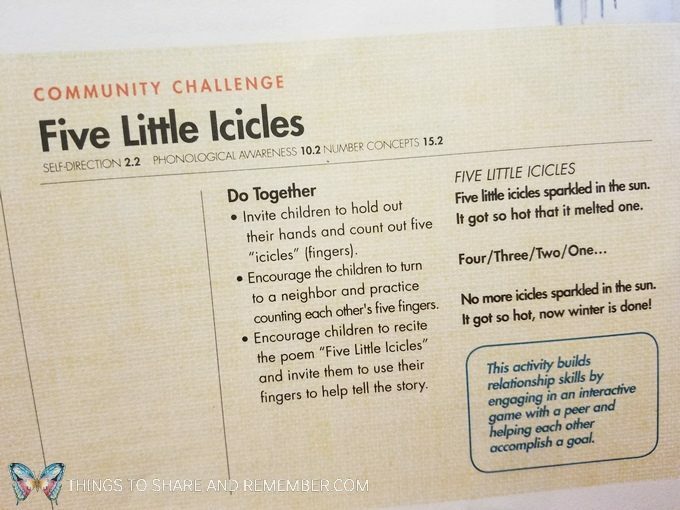 We began our circle time with the 5 Little Icicles Community Challenge. 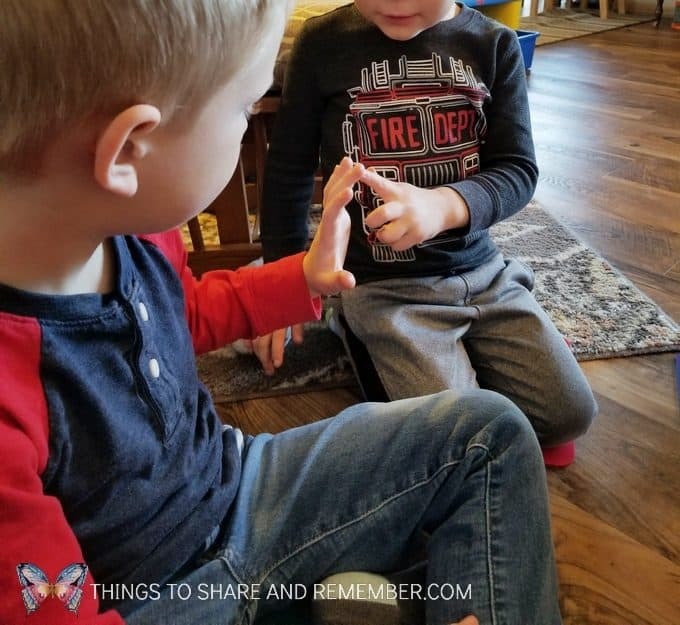 It’s basically a fingerplay counting activity, but I like that it involves a connection with others instead of an individual activity. 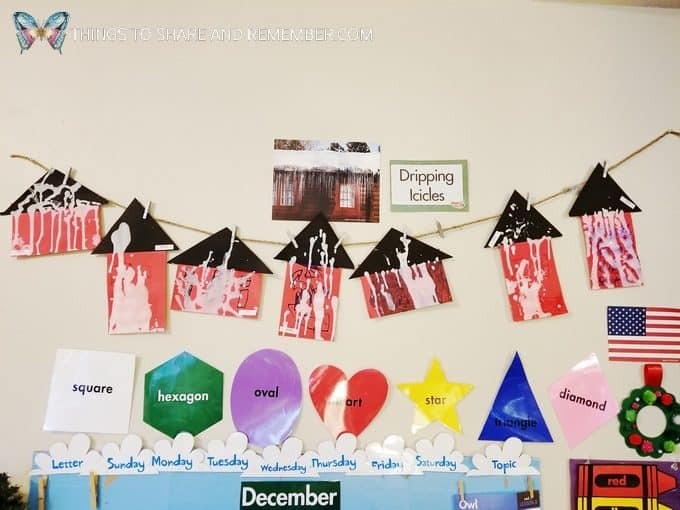 As it says in the teacher guide, this activity builds relationship skills by engaging in an interactive game with a peer and helping each other accomplish a goal. It was really cute to see the younger ones pointing to each finger and counting. Something everyone could do or attempt! 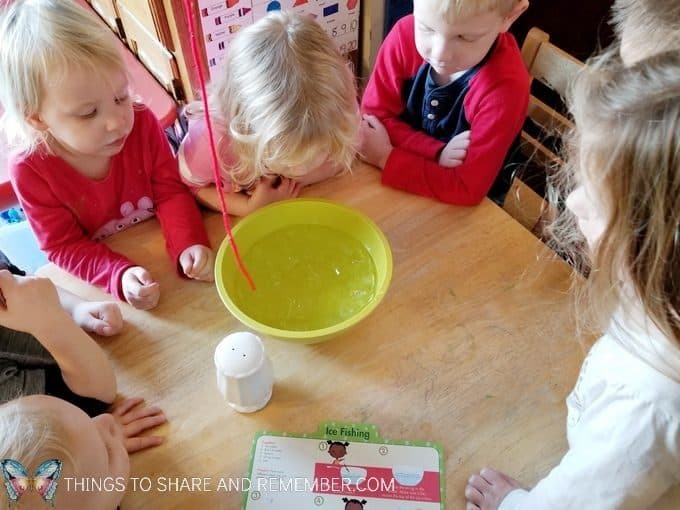 We love doing science experiments! This one is called “ice fishing”. Everyone can observe but it’s more fun, if everyone can try it themselves. During the experiment, I focused on saying, first, then, and next. So simple, yet a necessary lesson that’s easy to include while speaking to children once we are aware! 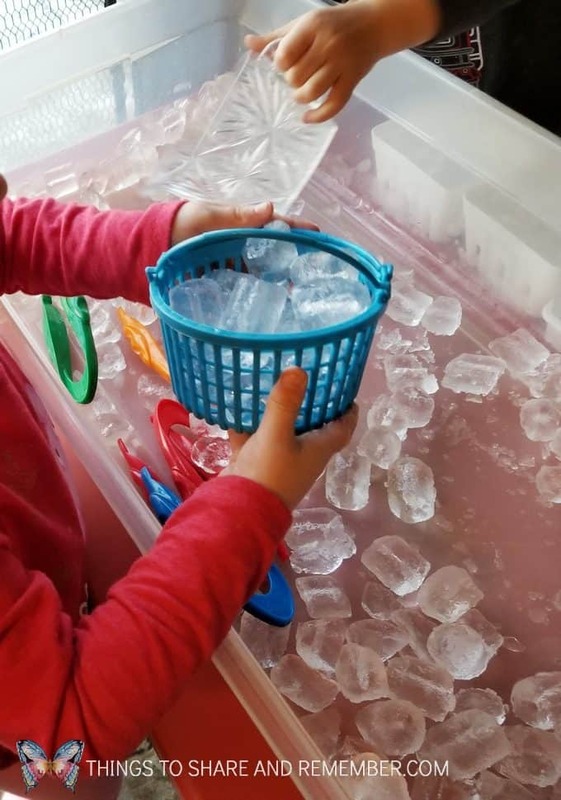 First, we poured the water over the ice. 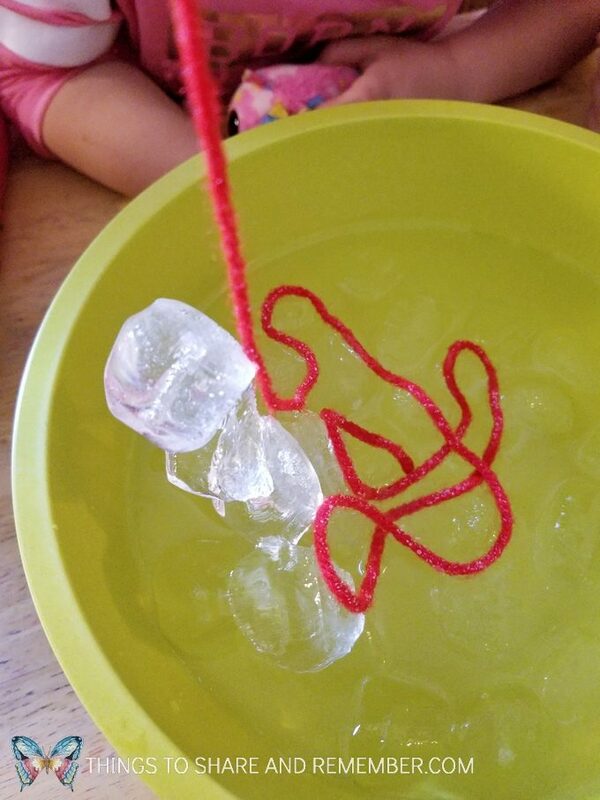 Can we pull out a piece of ice with the string? 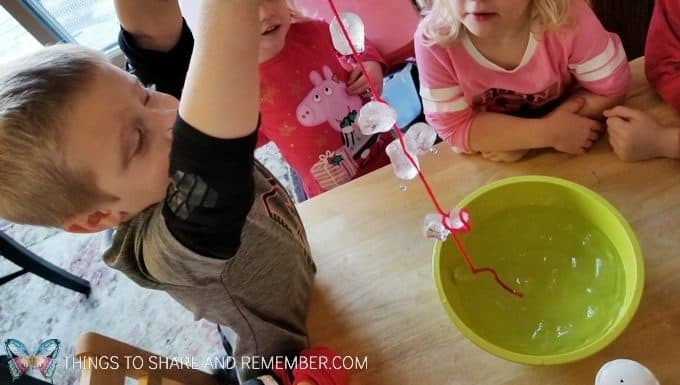 Can we “catch” a piece of ice? No, we can not. 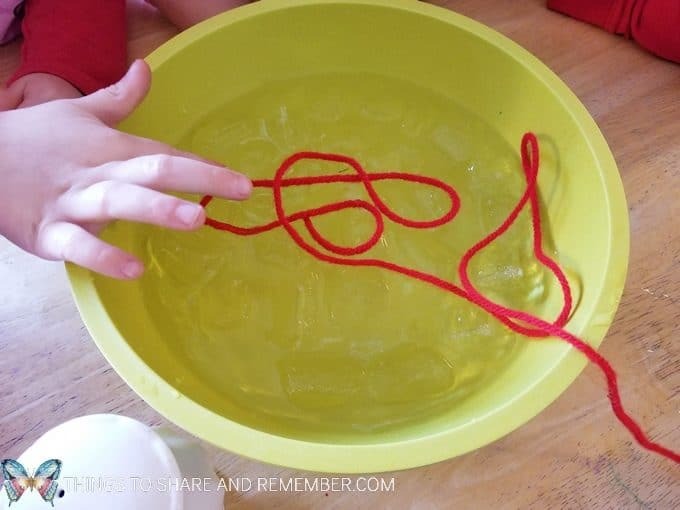 Next we tried laying the string in the water and then sprinkling salt on it. We waited patiently. What will happen? 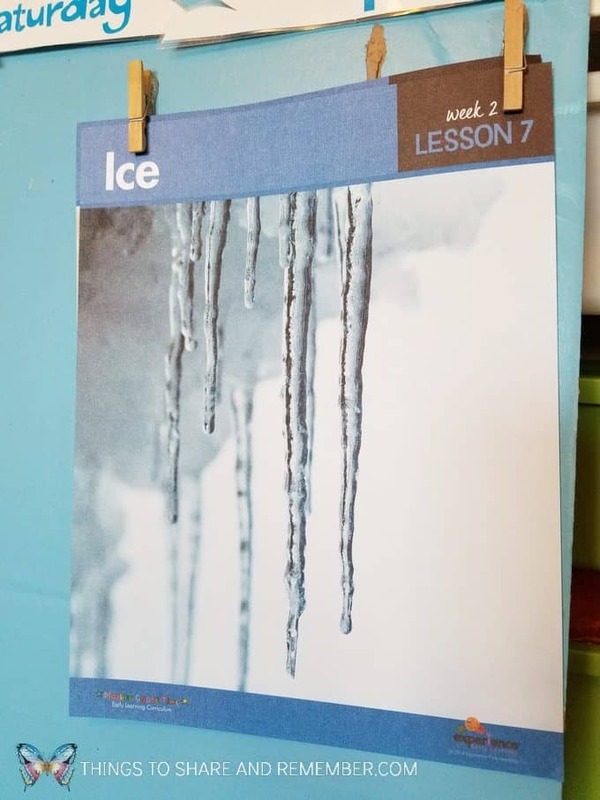 How can we catch some ice? Then, we tried picking up the string and we caught some ice! It’s really cool, but why does it work? 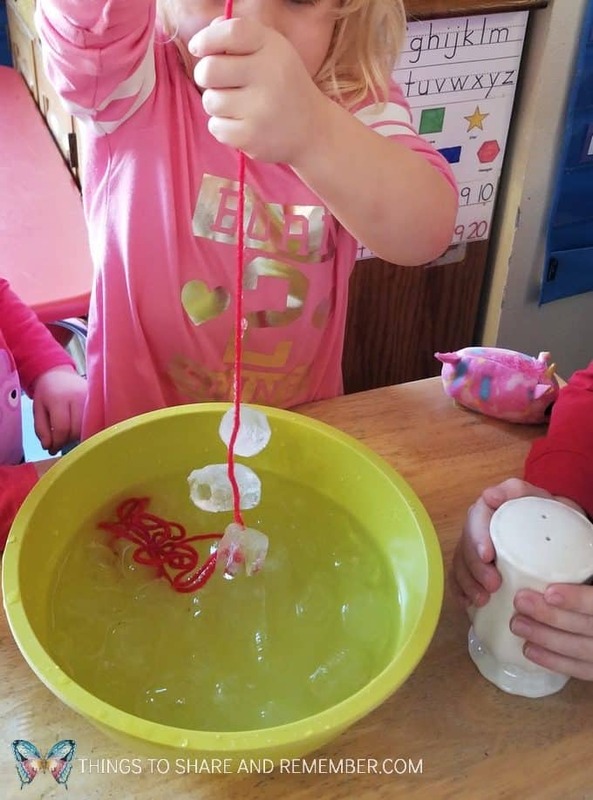 How does the salt help us pick up the ice with the string? First D gives it a try and he catches some ice. Then A gets a turn. She picks up some ice with the string too. Want to know how it works? 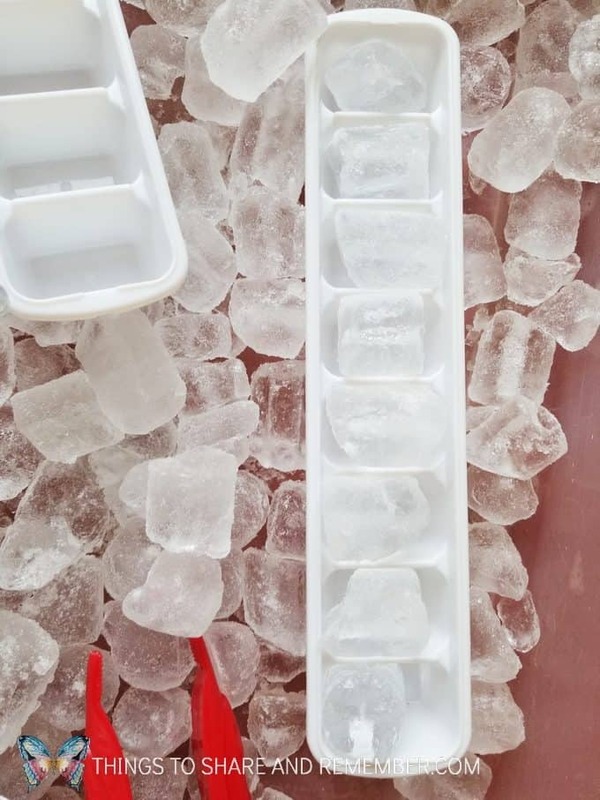 The salt sprinkled on the ice begins to melt the ice. Then it quickly freezes again, sticking to the string. We tried it over and over again. 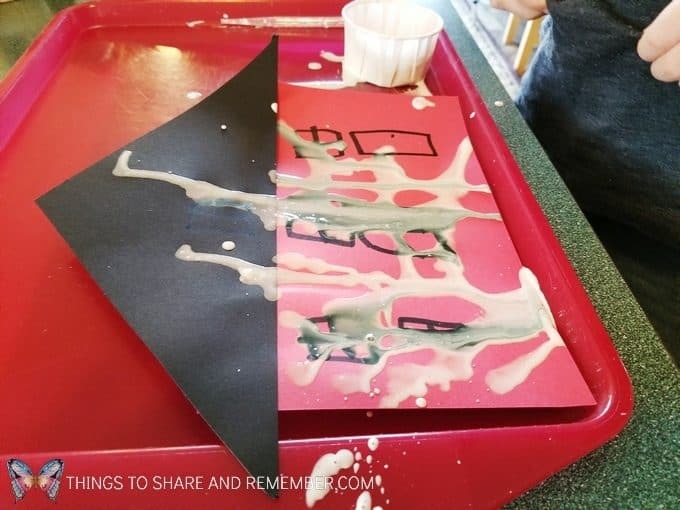 Super cool experiment! 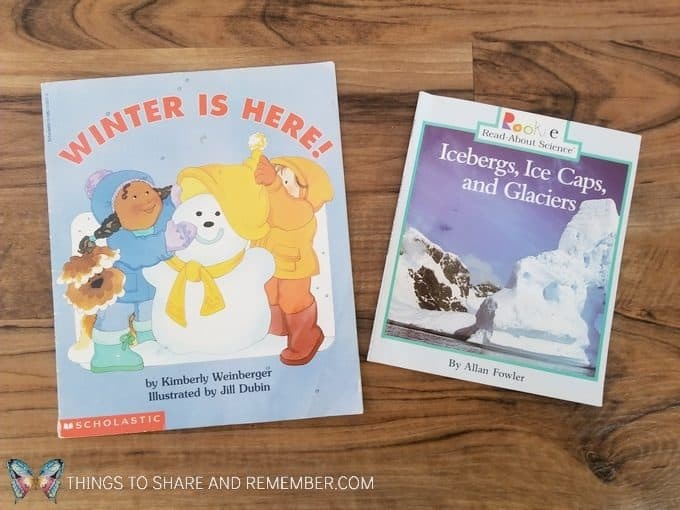 Two of the books we enjoyed about winter and ice are Winter is Here! 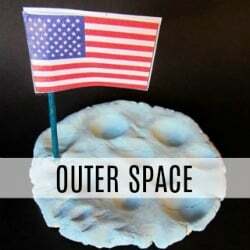 and Icebergs, Ice Caps, and Glaciers. 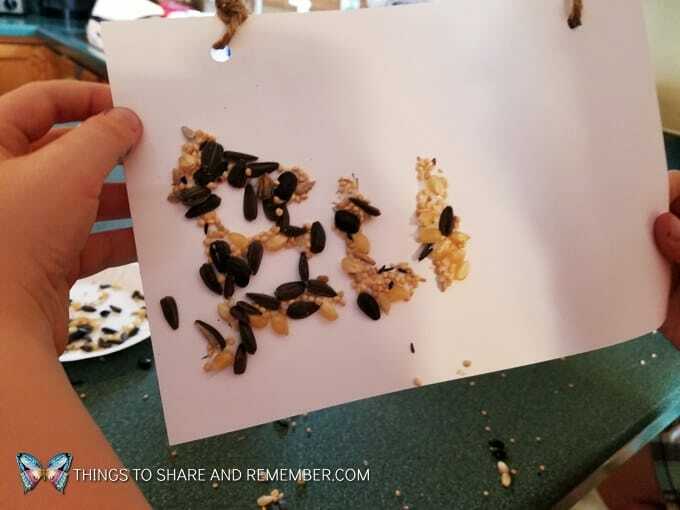 We have done this activity before and it’s always a hit. I no longer have a large easel so we make do, and make do very well, I’d say. 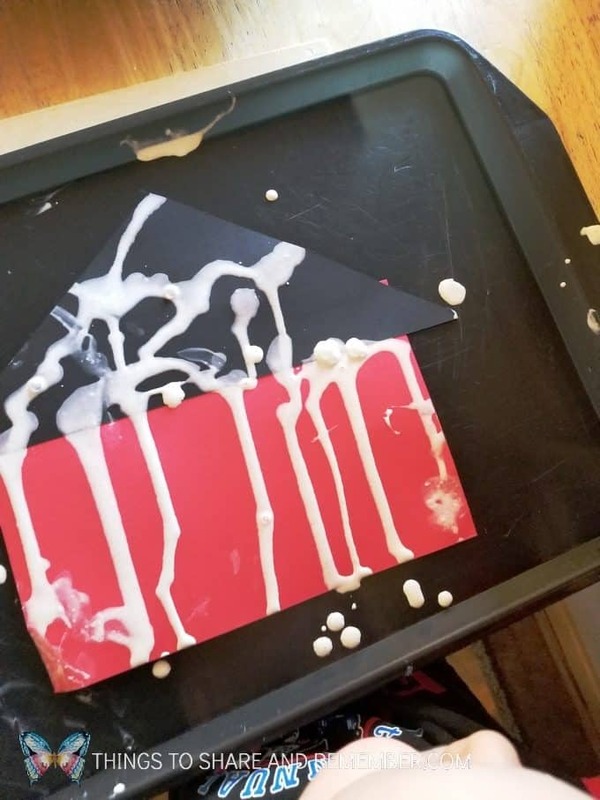 I just put a block under everyone’s tray so their work surface is slightly tilted. Then when they squeeze the thinned out paint through the pipettes, it drips nicely. The littlest ones can be successful too, with some assistance. 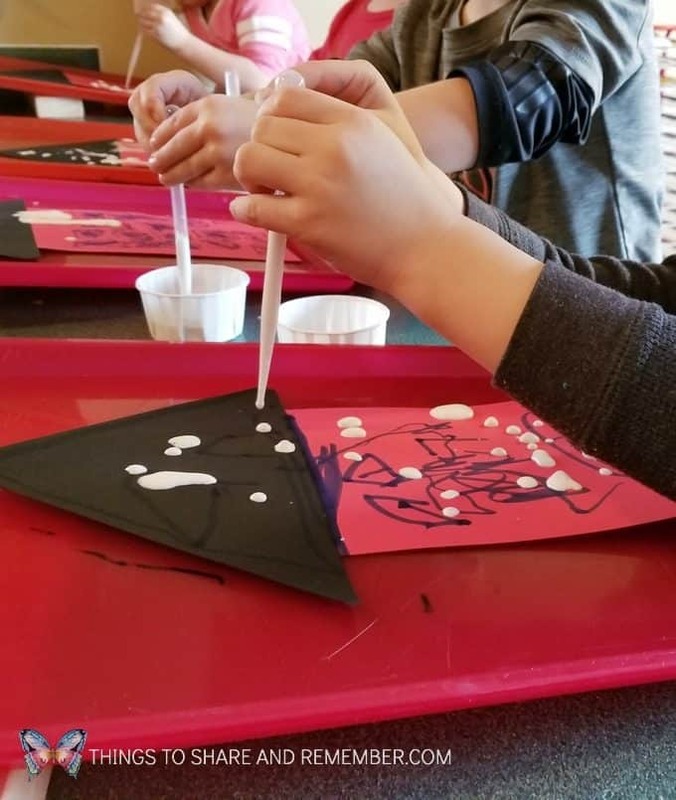 Pipettes are wonderful for developing fine motor skills, eye hand coordination and hand and finger strength. 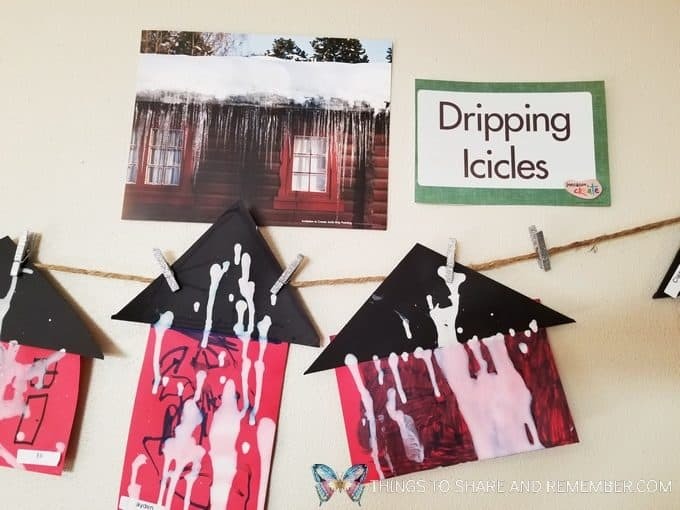 Here’s how we displayed our winter houses. They look so festive for winter and the holidays. 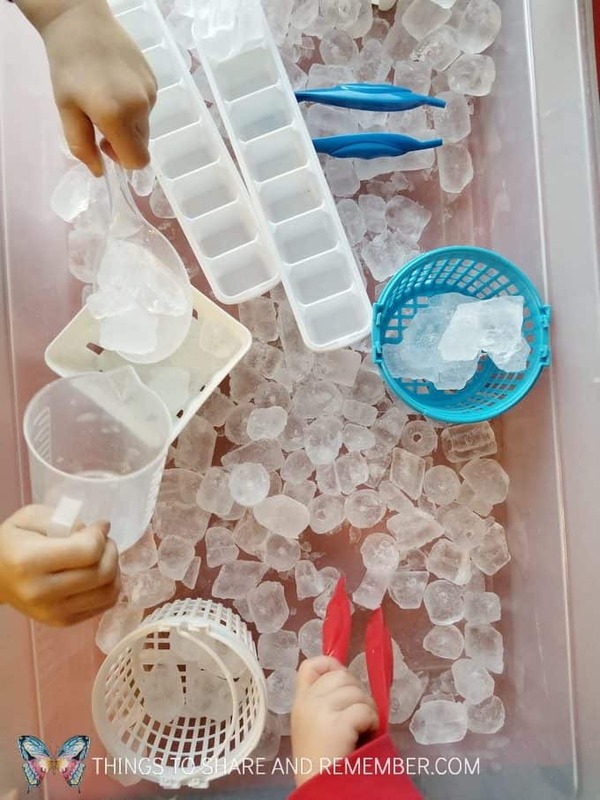 This may be the best $1.29 I’ve ever spent – on a bag of ice for the sensory bin! Seriously, the ice was slow to melt and we got a lot of use out of it. 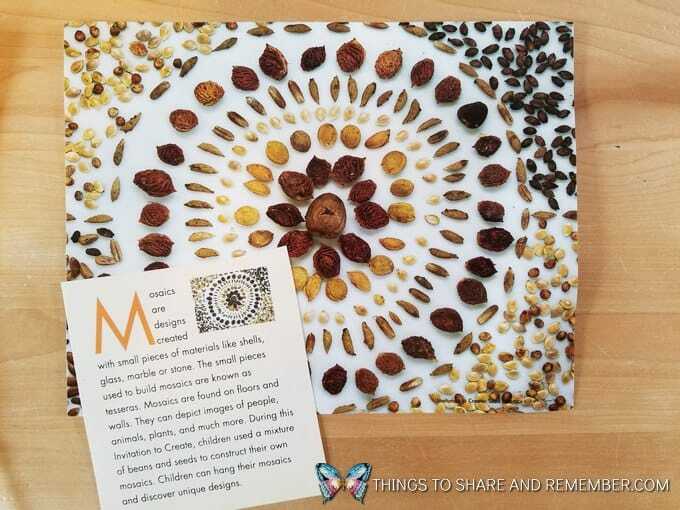 Mother Goose Time included this science and nature activity in the STEAM Stations suggestions for this week. The activity focuses on sound so it connects perfectly with the Sights and Sounds theme. 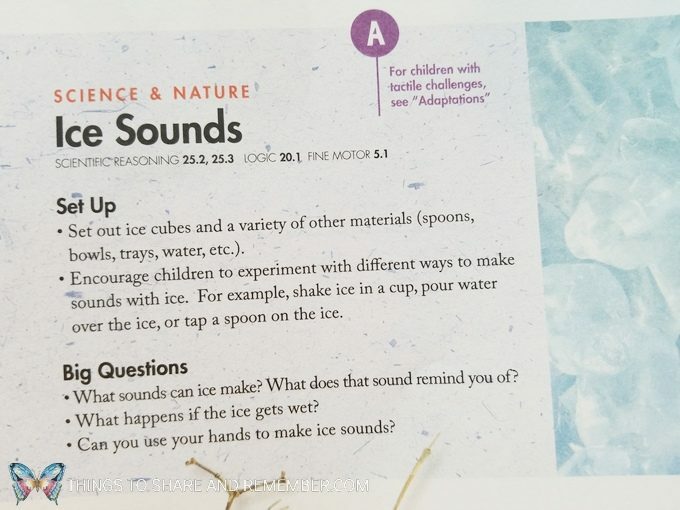 Asking questions while the children play encourages them to think creatively and work to create sounds with the ice. We did some of that, but they explored the ice effectively on their own. 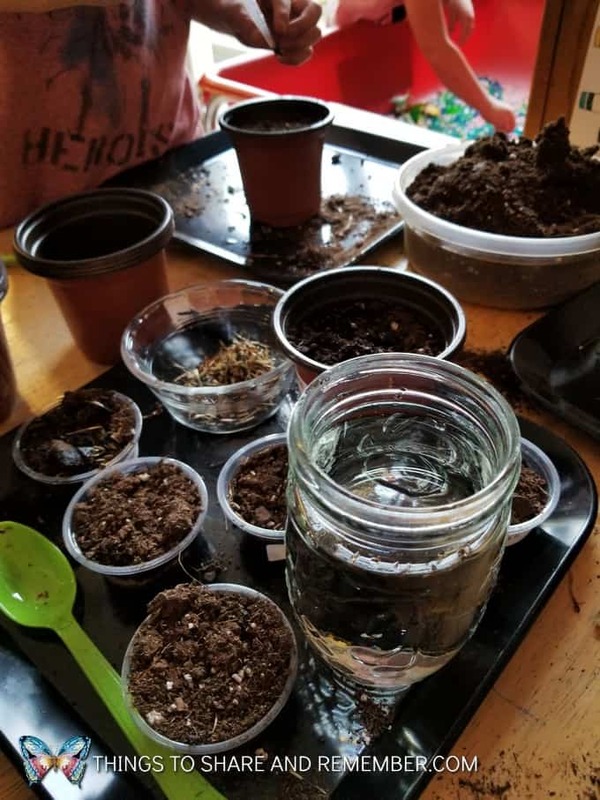 Most of my sensory bins are simple, just adding a variety of tools and containers to the main filler. 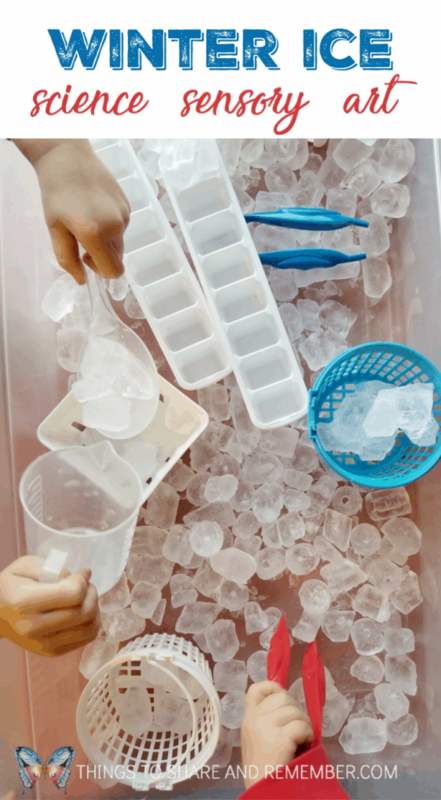 In this case, using baskets with openings allows water from the melted ice cubes to drain out. 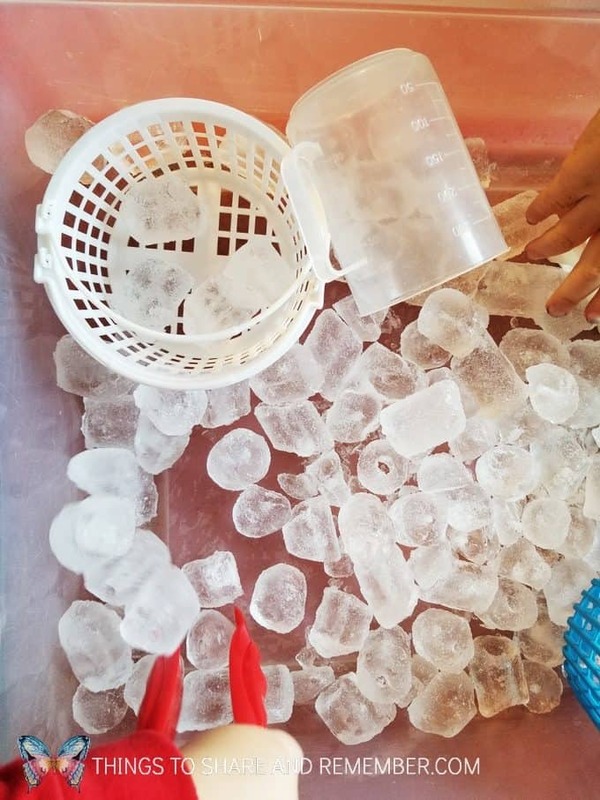 Since ice is cold, we used spoons and tweezers to pick up the ice. 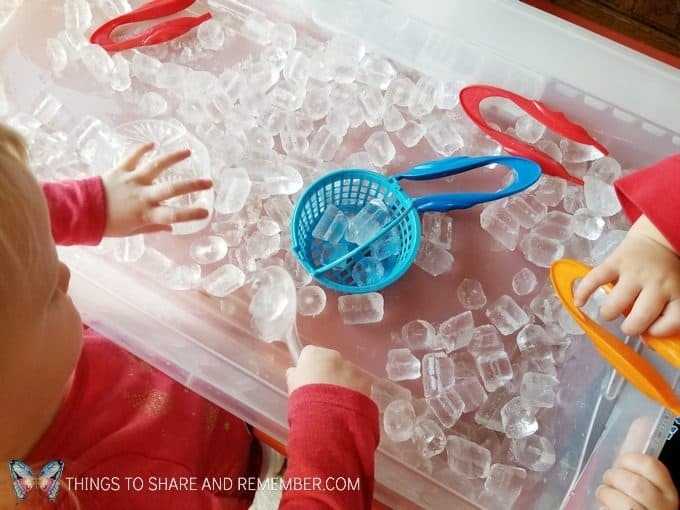 Ice cube trays are always awesome in sensory bins but it’s cool that we can put ice cubes in actual ice cube trays! 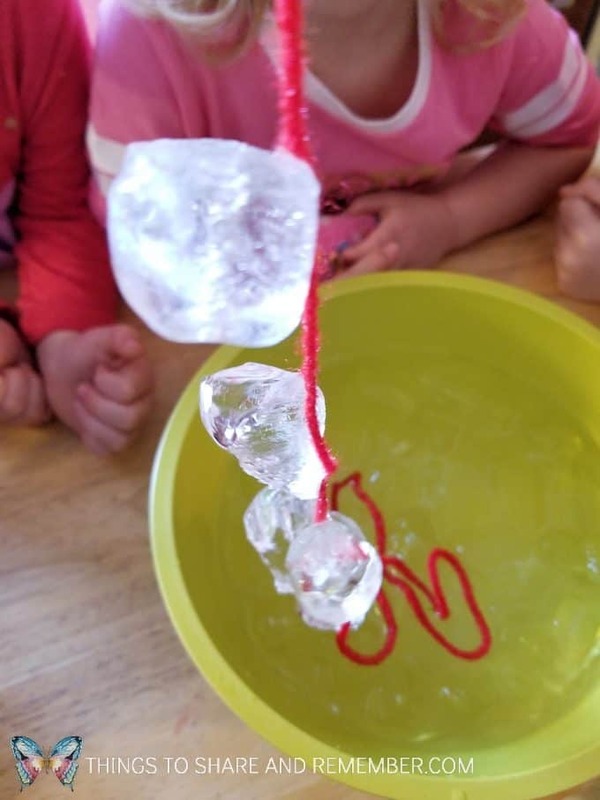 What a fun filled day of discovering sounds of nature, investigating freezing and melting and using our senses to learn about winter ice. 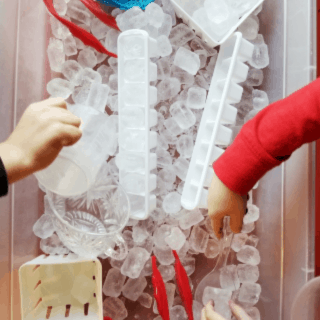 Also, try our Fizzy Ice Sensory & Science bin. 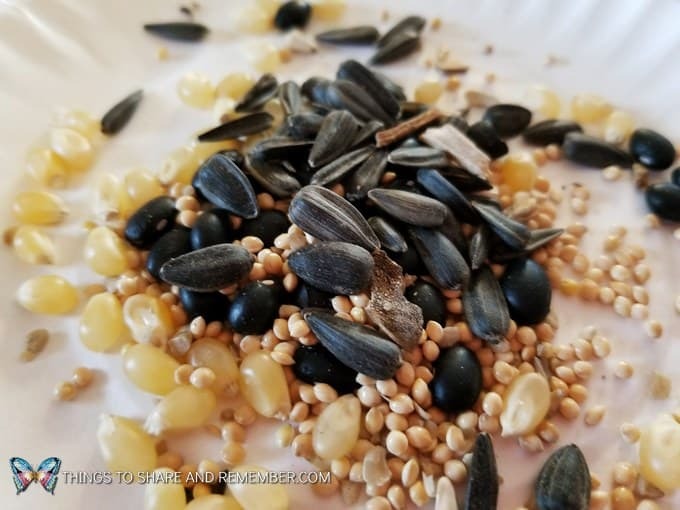 It’s that time of year again to plant some seeds! 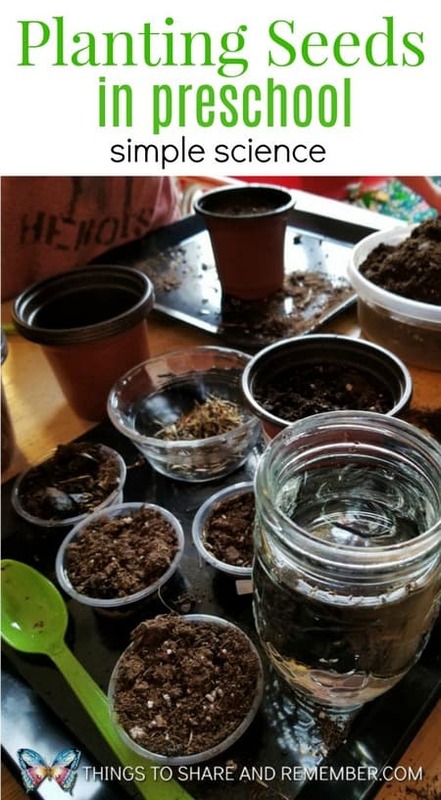 Planting Seeds in Preschool is such a wonderful hands-on experience for children! I love that it doesn’t have to be a big production to be meaningful. 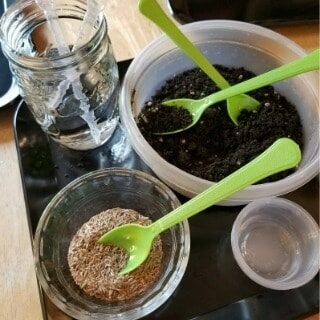 Just a small bean seed or a little container for soil and grass seeds! Both of these offer quick and exciting results. 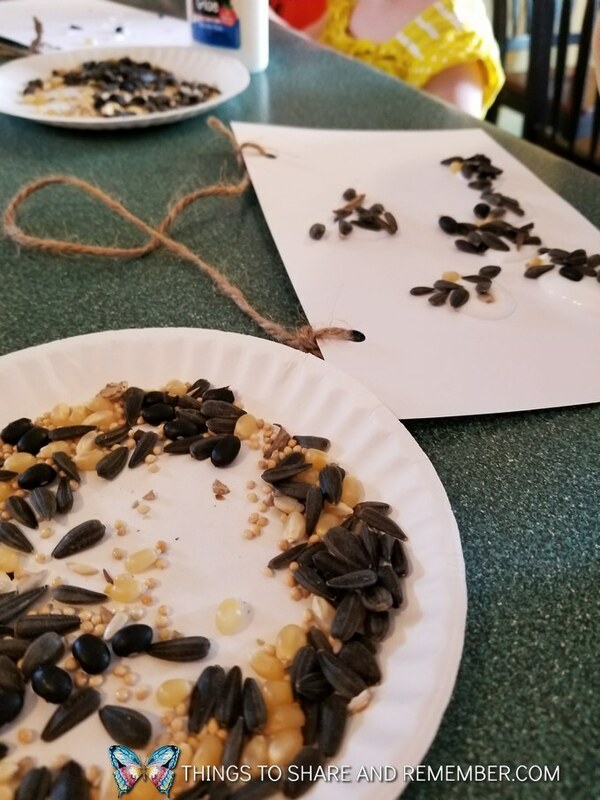 My group was so excited to do this little project. 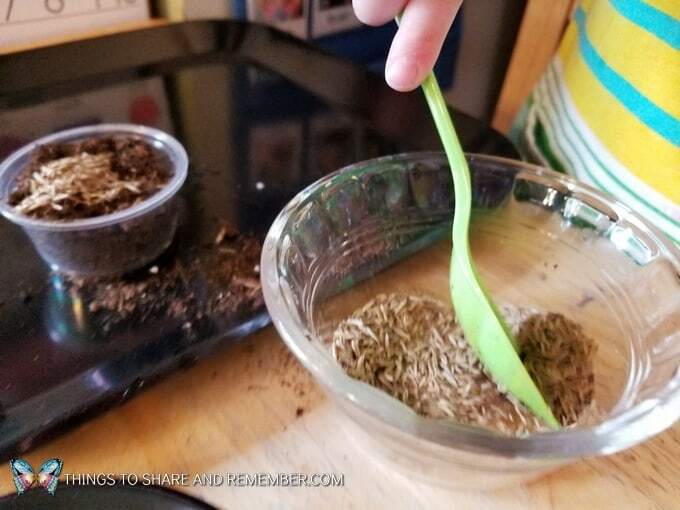 Everyone was visibly excited and engaged in this activity from Mother Goose Time – simple planting grass seeds in a small cup. 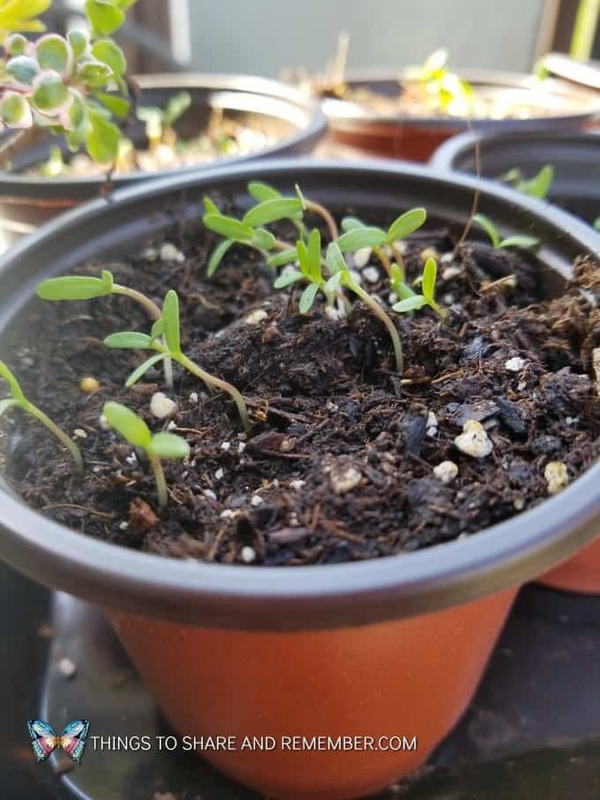 It was over much too quickly so we also planted a larger pot of marigold seeds using seeds I had saved from our flowers last year. 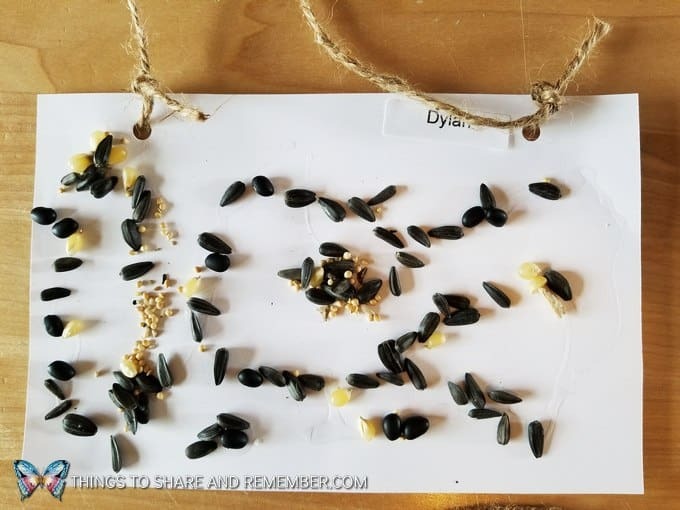 Most of the children are able to remember the orange flowers we had in our planter last year so this was a meaningful cycle for them to understand the seeds could be saved and planted again. 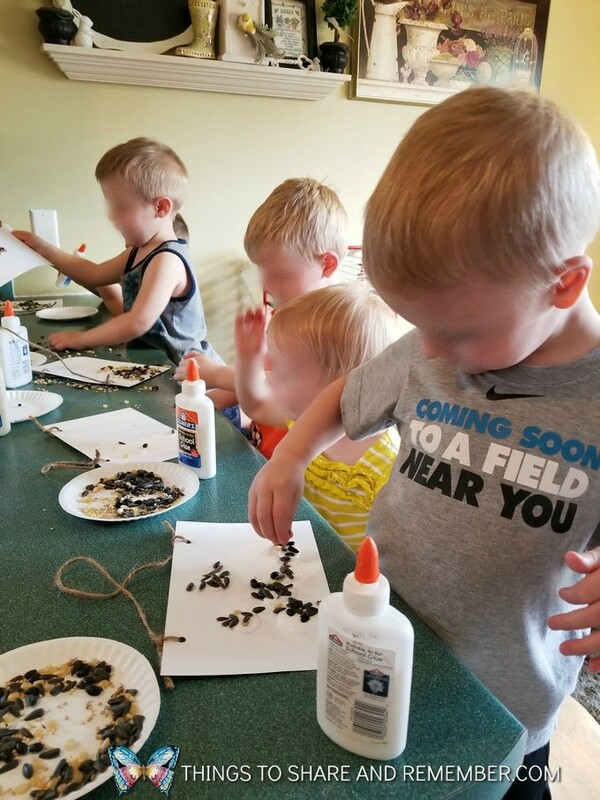 They were anxious to get started and you could see their little eyes taking in all the supplies and their minds processing what to do first and next, which resulted in their hands quickly. 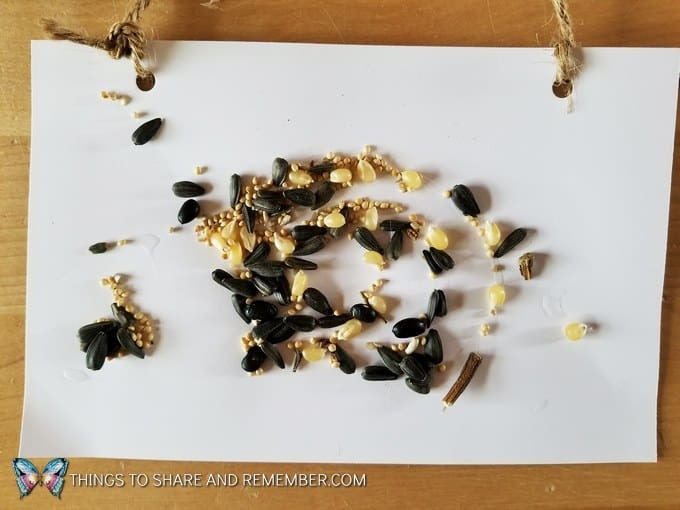 In an effort to slow down the process so it could be done appropriately and meaningfully, I asked them to identify the items we would be using. Some used the spoons and some used their hands. It’s important to offer tools and be flexible. It all works! 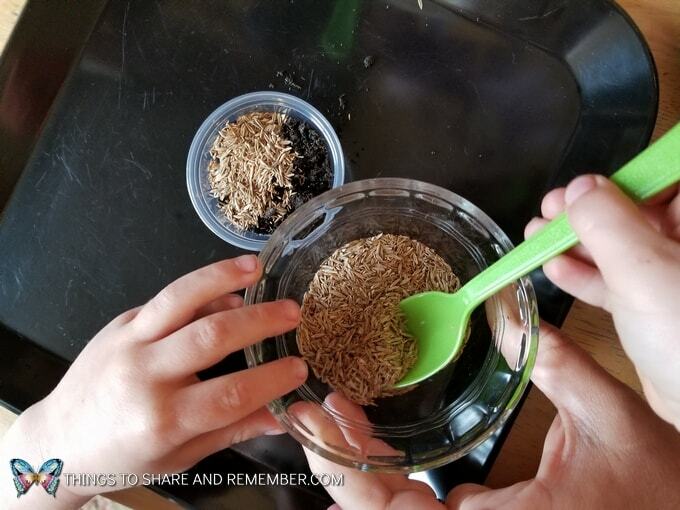 This little one was frustrated with the time it was taking to squeeze the pipette and water her seeds so she picked up the jar and poured. Great! 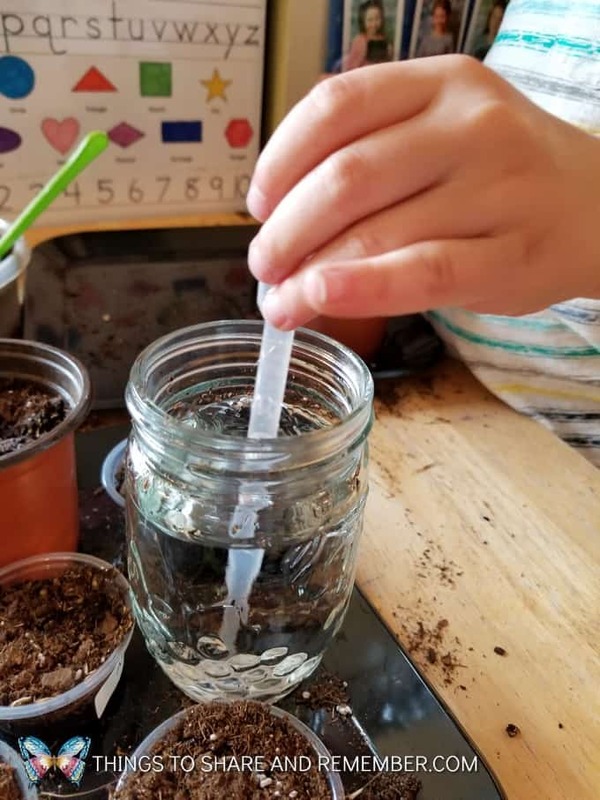 The pipettes for watering slows down the process and prevents the flooding of the seeds plus works on the fine motor skills we need practice with. 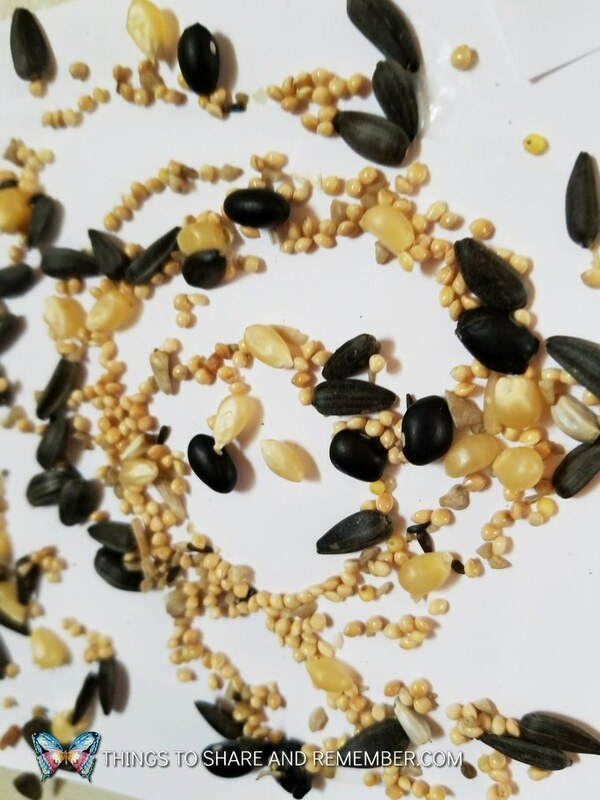 We compared the grass seeds and marigold seeds. 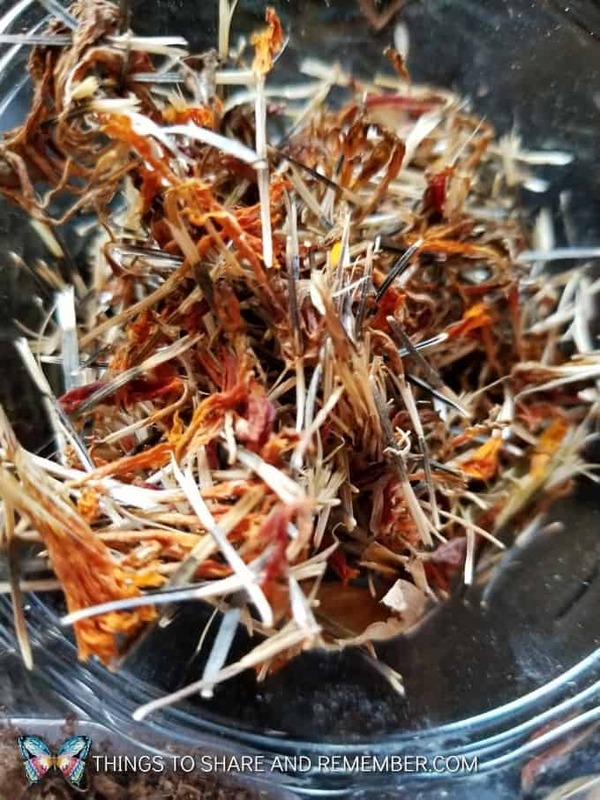 Marigold flower seeds are colorful like the blooms. 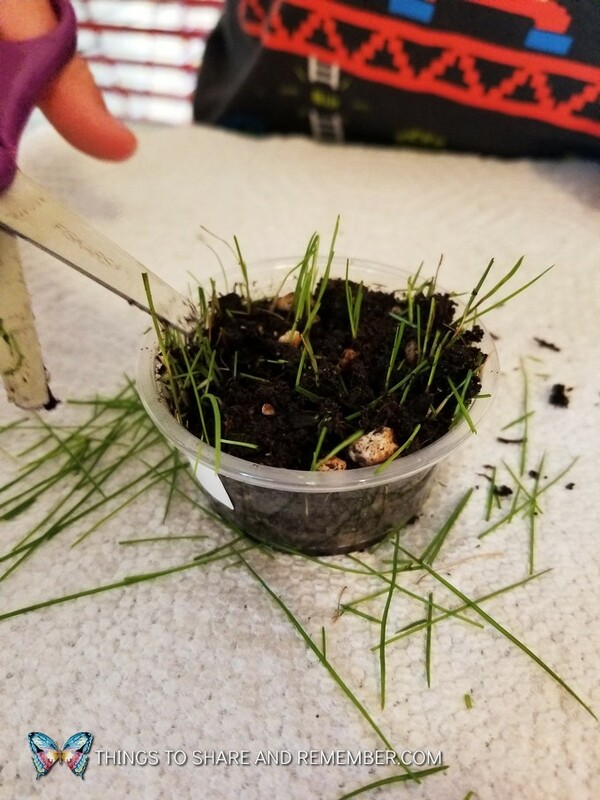 It didn’t take long to see tiny sprouts! It will take longer for the marigolds to grow but that will be fun to watch too. Every day we check to see if they need to be watered. 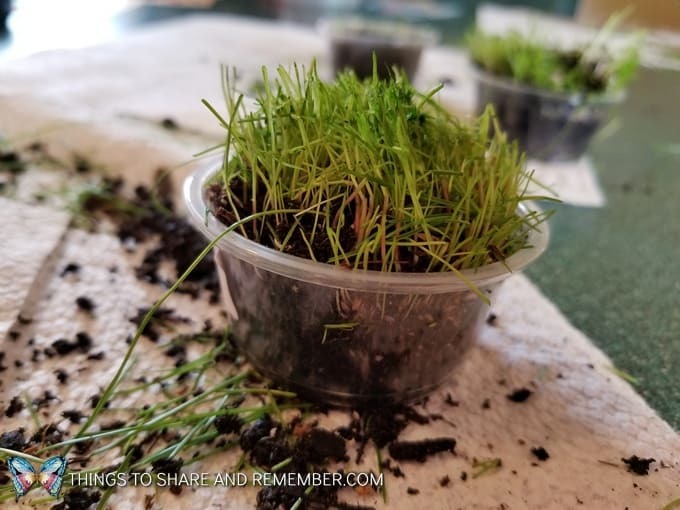 The grass grew quickly and soon needed to be cut. That’s the fun part! For some reason, this one didn’t grow as much. 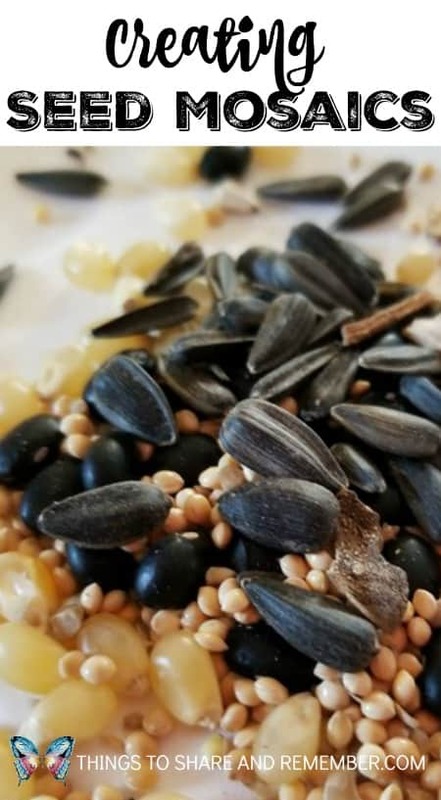 He certainly had enough seed in it! 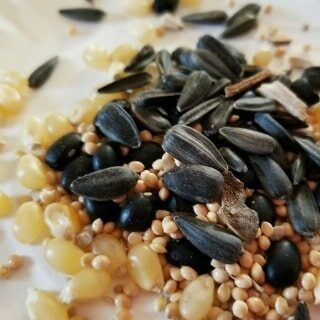 Maybe this was the one that got dumped and the seeds ended up all mixed in? 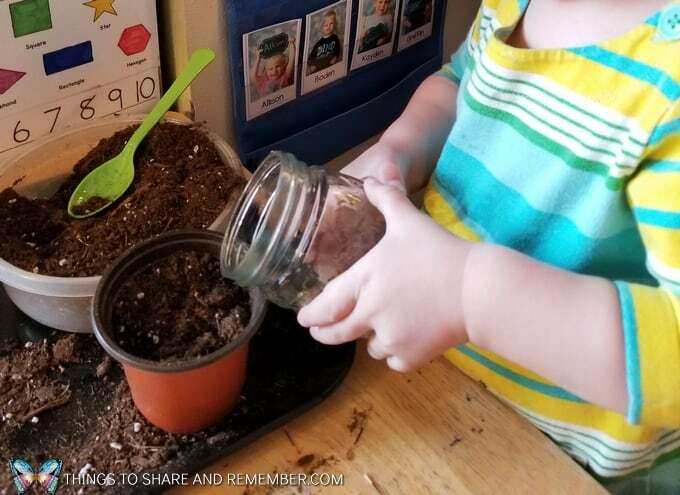 That’s part of the learning process in planting seeds in preschool. 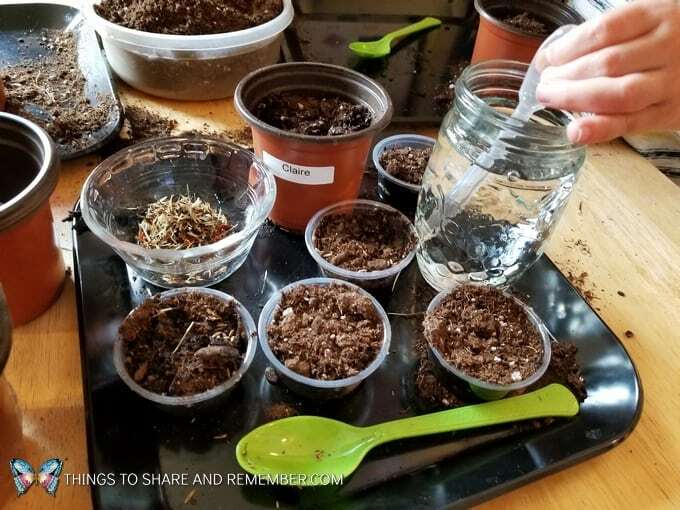 It’s on going learning through a little seed planted in soil that we can watch and observe for many days and weeks to see what happens. 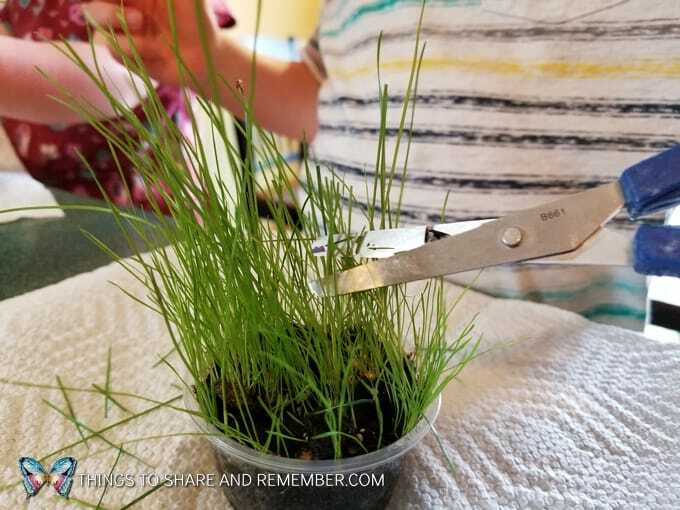 He helped the younger ones who needed assistance cutting. 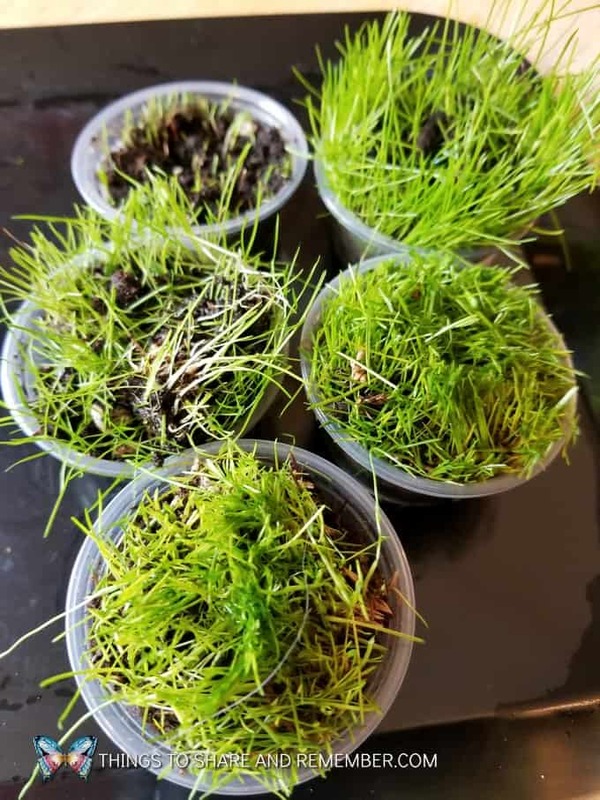 We hope the grass grows again so we can cut it again! 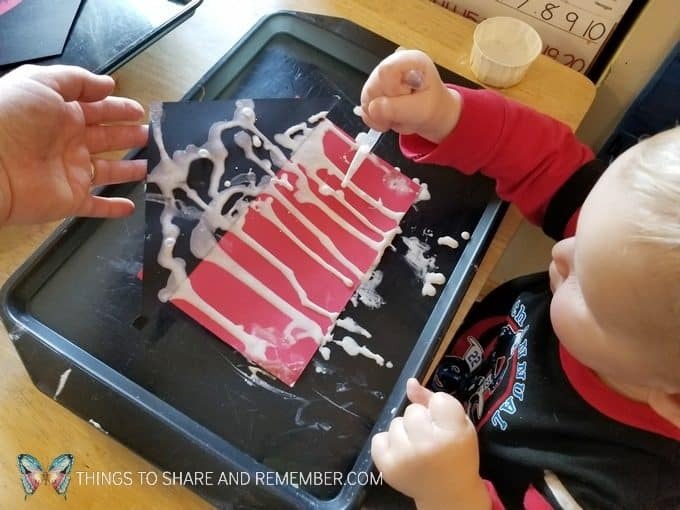 Such a fun sensory and fine motor experience! 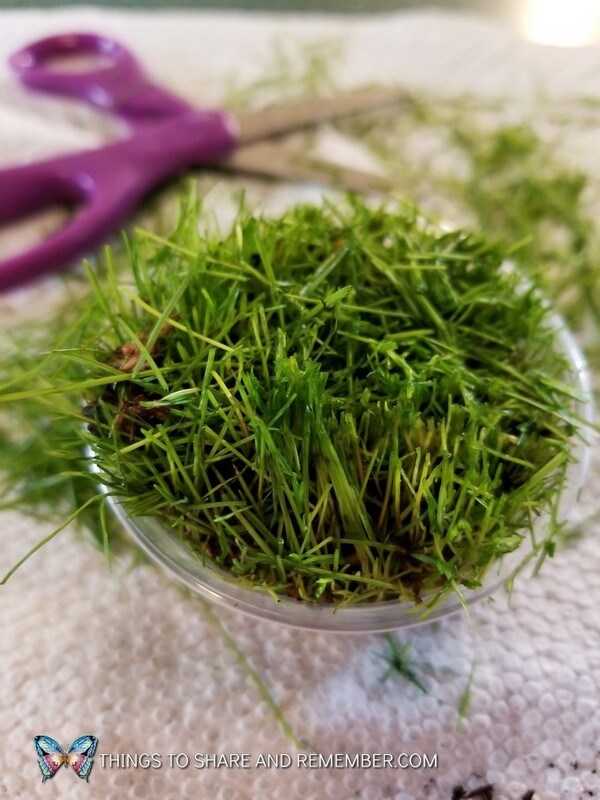 Cut grass smells good. Now we wait for the grass to grow long again. 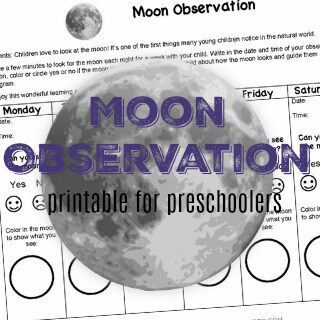 As I prepare for next month’s theme on space, I decided to create a Moon Observation Printable for Preschoolers to work on at home with their parents. 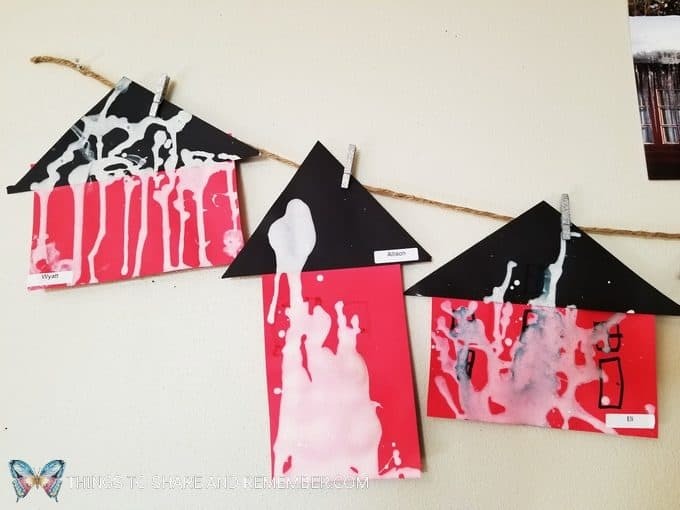 I’m always looking for ways to engage parents and this is a new activity they may enjoy together at home and even better that it directly relates to our theme. 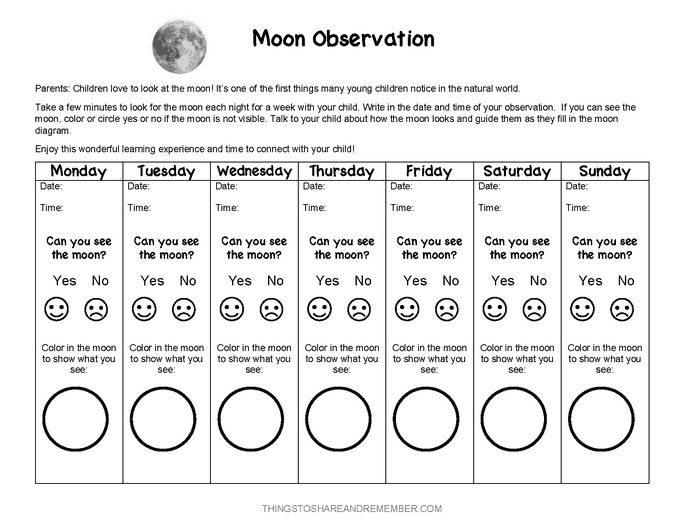 Observing the moon for a week and recording those observations is not “preschool homework”. 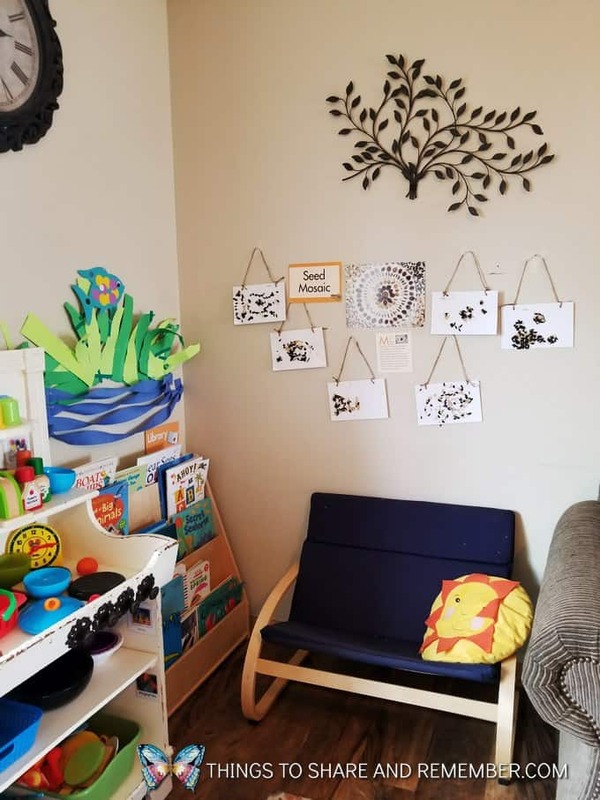 What it is an opportunity for parents to participate in our curriculum and support the connection between home and school. 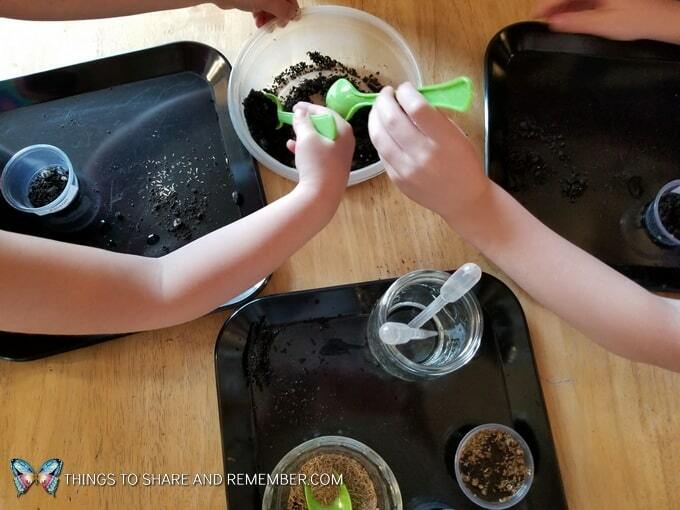 Learning together is a wonderful way for parents to connect with their children. 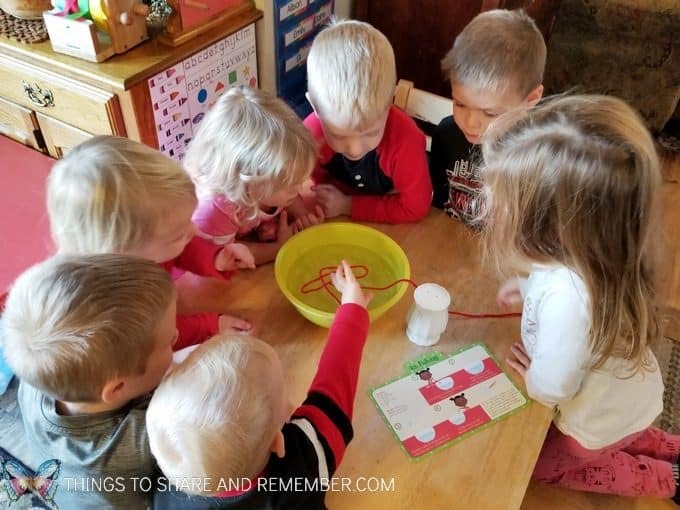 It will only take a few minutes and yet, it opens up the opportunity for ongoing learning for the child. We want to support the parents in being their child’s first and most important teacher and family engagement activities support that belief. 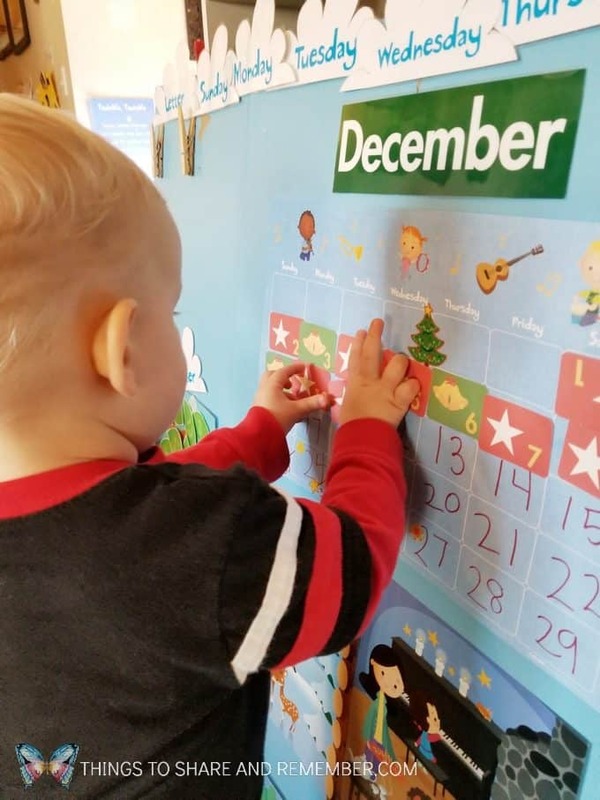 I created the form to cover just one week because I believe that would be developmentally appropriate for preschoolers and parents are more likely to participate if it was for one week rather than the full month. 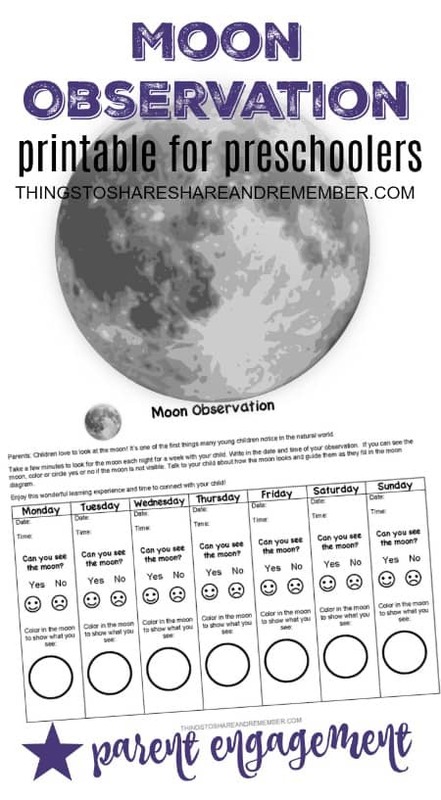 If you wanted to observe for the full month, just print multiple pages. 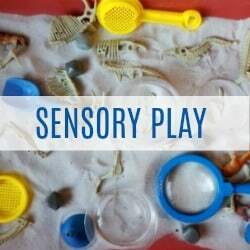 Creating sensory bins is one of the most fun parts of planning my environment. Each one can be different depending on the theme we’re learning about. Nearly anything can go into a bin, just see what you have! 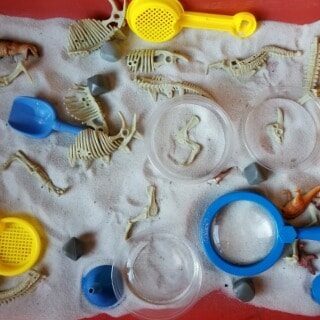 I pulled together a combination of materials we already had to create our dinosaur sensory bin. 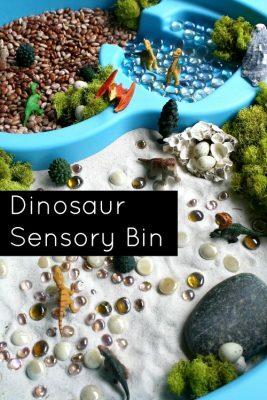 For inspiration, I’ve included some other dinosaur sensory bins that might be of interest to you. 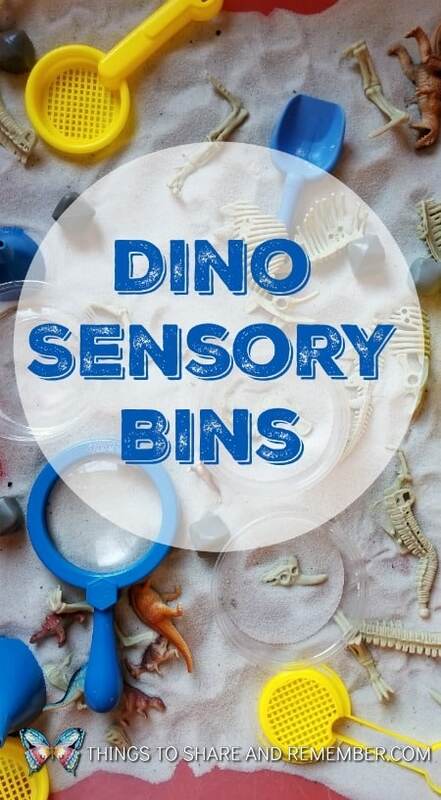 There are lots of options for making dinosaur sensory bins. Ours is an excavation dig theme. 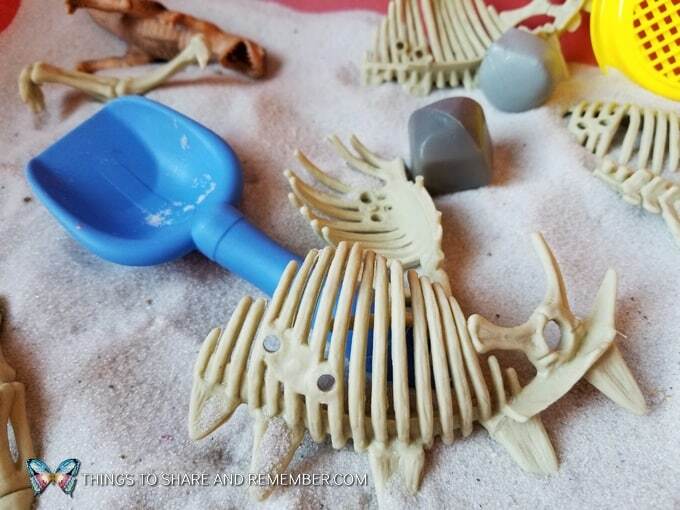 The dinosaur bones set pictured was originally from the dollar spot at Target several years ago. 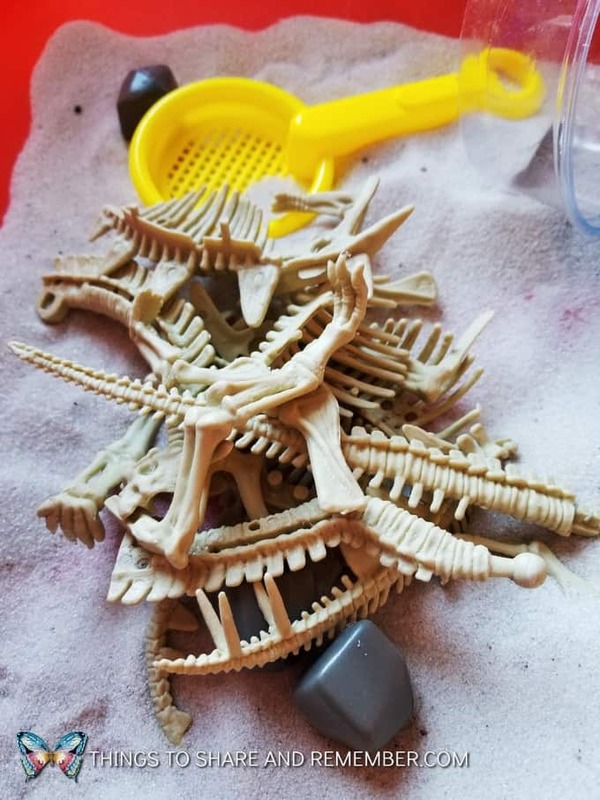 I’ve included links to other dinosaur skeleton sets that you might consider. 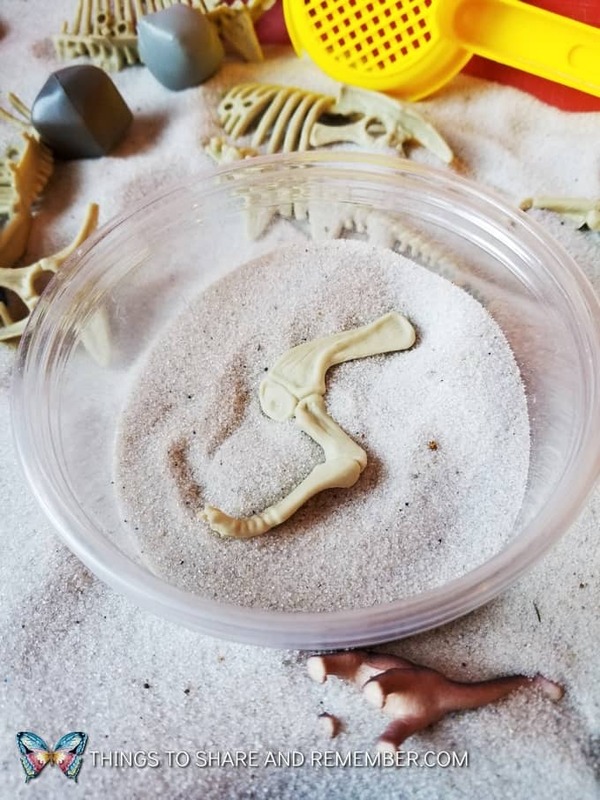 Sifting sand and finding dinosaur bones is exciting! 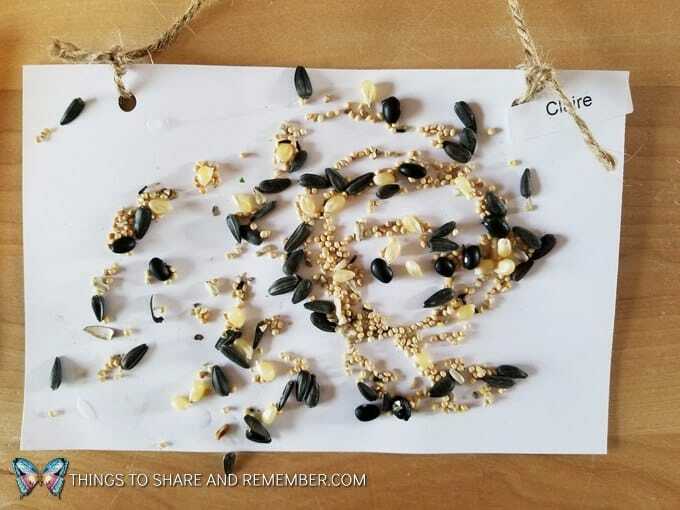 Offering a variety of materials allows children to play in different ways. 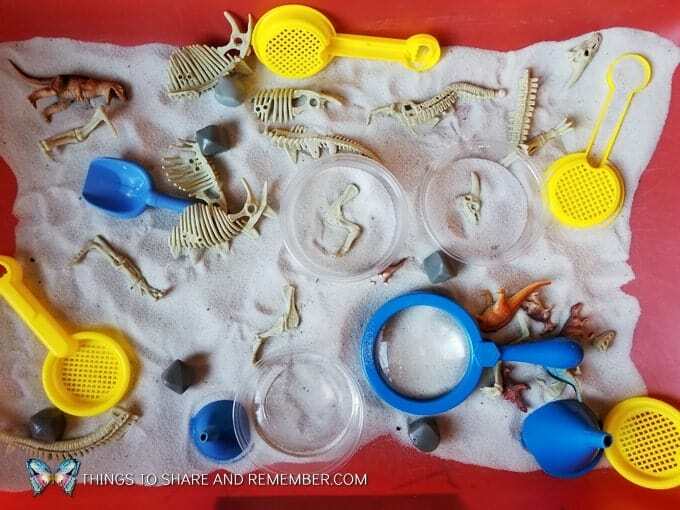 The sifters that are pictured are no longer available but some are included in this Dino-Dig Excavation set. I wish they were more readily available. I bought mine on clearance from Discount School Supply and I can’t seem to find them elsewhere. 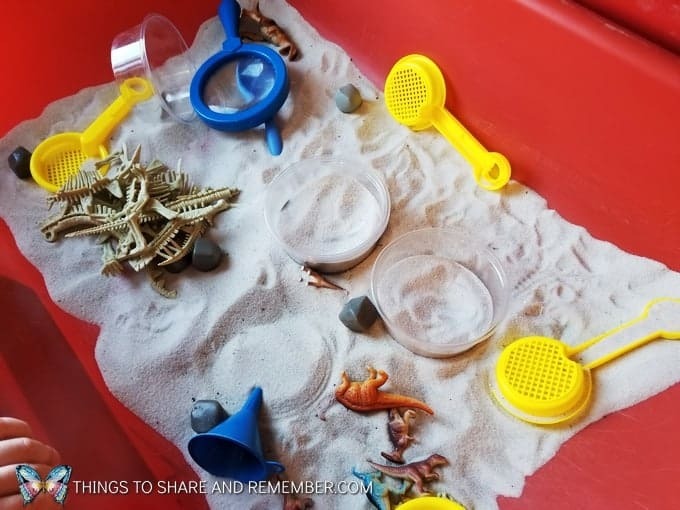 A sand sensory bin staple! 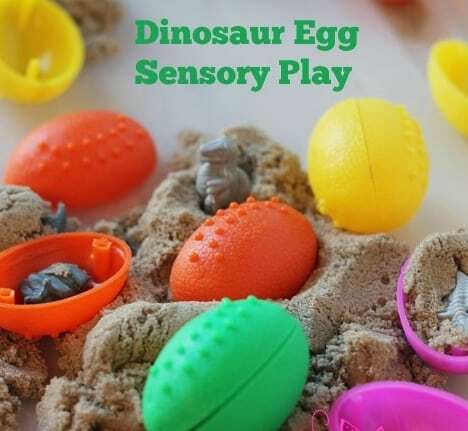 There’s no end to the ways you can set up your dinosaur sensory bin. Use some creativity and make more than one. 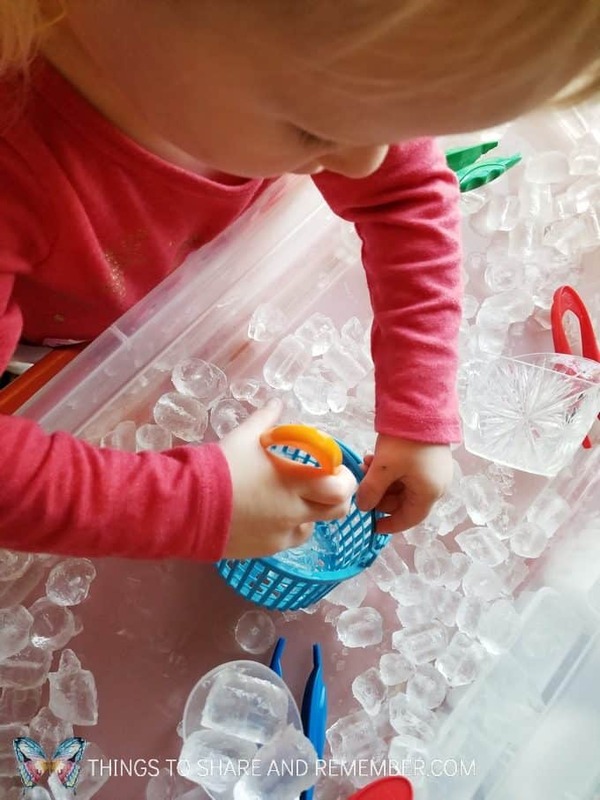 Rotate your sensory bin often so children do not become bored with the contents. 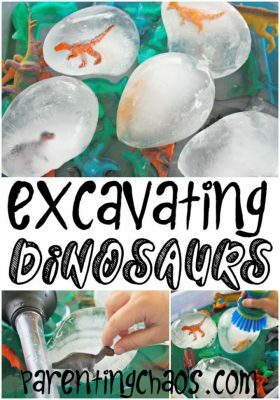 Our Dinosaur Egg Sensory Bin was awesome too! 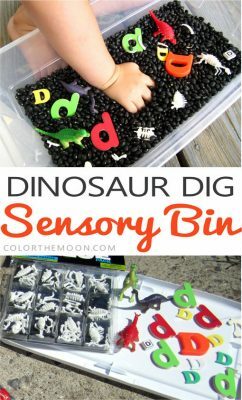 Check out these great dinosaur themed sensory bins!